We love books. Our goal is to provide honest reviews for others who love to read. Most books for review are provided by publisher, author or PR firms. We are not financially compensated or obligated to give a favorable review. Exiled in shame and wounded in battle, Caden O’Byrne accepts a mission to go into enemy territory to find his healer’s long-lost daughter. At worst, he’ll get his death wish. At best, this could be God’s second chance. But the lovely, larcenous Sorcha will have no part of him, his God, or the rescue…until a murder forces them both to run for their lives. While Caden’s rekindled faith is tested, Sorcha wonders if his God is real. Add to the mix a stargazing princess, a capable dwarf, a scheming witch, an improbably beautiful eel fisherman and you have the ingredients for a surprising, page-turning tale. King Arthur’s Scotland comes alive in this addictive saga of intrigue, treachery, second chances, and the liberating power of love. Thief is book 2 in the Brides of Alba series, and a smashing sequel it is. Plenty of sword fights, intrigue and romance is woven into this historical tale. Right from the beginning, lovers of everything medieval will be hooked into the daring battle where hero Caden saves King Arthur. Caden is a man’s man. Burly, strong of character, not one to back down, he’s quite the hero to contend with. However, heroine Sorcha is just the one to take him on. Feisty and determined, she’s a rival fully equal to him. Linda Windsor is imbued with a talent for immersing her readers in the time period she writes in. In her Brides of Alba series, readers are whisked away to sixth century Scotland amidst lairds, bards, druids, Saxons and Celts where adventure, intrigue and spiritual conflict were rife. 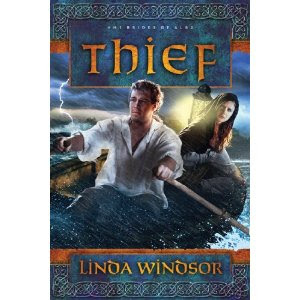 Thief is Caden's story, a man disgraced and discarded for the betrayal of his brother Ronan and their clan. Linda captures Caden's fatalistic demeanour and Sorcha's compassionate heart with minor characters uncommonly substantial. While she weaves a tender love story it is the historical element that takes precedence along with fascinating characters and a meaningful spiritual exploration. Thief is a wonderful story and makes me long for Alyn's adventure in Rebel, releasing in 2012.